Above: The Sprint Clinic participants with Ethan Mitchell, Sam Webster and Eddie Dawkins after raising over $1000 for the Canterbury Earthquake appeal. 28/02/2011 - BikeNZ’s world class sprinters utilised their cycling skills to raise money for quake stricken Christchurch. Commonwealth Games medallists Eddie Dawkins (Southland) and Auckland’s Ethan Mitchell and Sam Webster ran a coaching clinic at the ILT Velodrome today. Over 40 riders attended the session and each made a donation to attend the session. Along with the donations given at the RaboDirect Elite Track Championships over the weekend the riders raised over $2500 for the cause. “We are teaching these riders the important bike handling skills. I didn’t learn these until two or three years ago – I was never taught them. By teaching them early we can give them a head start,” Dawkins said. For these young riders it was a rare opportunity to meet the heroes of the sport and train under their guidance. 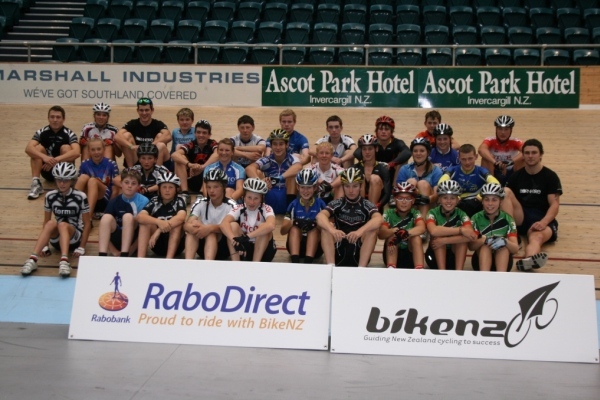 The timing of the session was ideal with top New Zealand junior riders in Invercargill ahead of the 2011 RaboDirect Age Group Track National Championship which start tomorrow. “We will be here throughout the week to watch these riders at their championships and will hopefully seem them put these tips into action,” said Webster. The skills covered in the two hour session included tactics and gate starts are applicable to all track cycling races, not exclusive to sprinting. The trio, along with their fellow BikeNZ track team riders, head into camp on Friday for the final build up to the UCI Track World Cycling World Championships in the Netherlands at the end of the month. The sprinters aren’t the only BikeNZ riders doing their bit for Christchurch. Olympic medallist and RadioShack pro rider Sam Bewley has donated a signed 2008 NZ Olympic cycling jersey to be auctioned with all funds going to Christchurch. The jersey is signed by the Beijing Bronze medal winning Team Pursuit team- Sam Bewley, Hayden Roulston, Jesse Sergent, Westley Gough, Marc Ryan and Pete Latham. Bids for this already exceed $2000. The auction closes on Saturday.